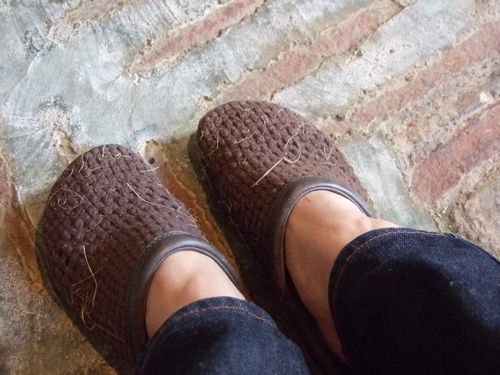 I took this woven sandal to Boisbuchet, at Vitra Design Workshops this summer. It was so appropriate and I had different experience from other type of shoes I took early years. Thick soled tracking shoes did not give me nice moisture impression from walking on wet morning grass fields. So, I walked wherever not surfaced, enjoyed temparature, texture and hairy grass on my feet. Now, I am back to my studio in London, wear these shoes and miss the atmosphere of Boisbuchet, but they do not react in the same way – I feel cold from foot in my studio, also slippery when I walk neighbourhood in this pair. Why? I realise that speed of walking is much faster in town, esepecially in rough quarter of London. I am not totally relaxed here, so this pair of sandales are for special occasion. It was perfect at Boisbuchet.